There are thousands of companies starting each year looking to find some way to tie themselves into the social media industry. Often times it can be rather difficult for people to keep track of what services does what. Sure, there are LUMAscapes that can help that, but the one thing that proves problematic is looking at how the industry has evolved. In 2008, Altimeter Group principal analyst and author Brian Solis, in association with design firm JESS3 (yes, that one), created The Conversation Prism, a research-driven infographic that looks at the social Web and its different divisions. Now, it has been updated with the addition of categories to account for the new services being developed today, including enterprise social networks, social marketplaces, influence, quantified self, and service networking. At first glance, the above graphic can be a bit confusing, especially when you gaze at the center of the graphic, so let us explain what it’s all about. In the center of the Prism is the business or the person spearheading the social campaign: you. From here, you can shift the outer circles accordingly to fit your intent, whether it’s about value, purpose, transparency, commitment, or vision. After that, it’s just a shift of circles in order to find the tools that properly align to your business goals. 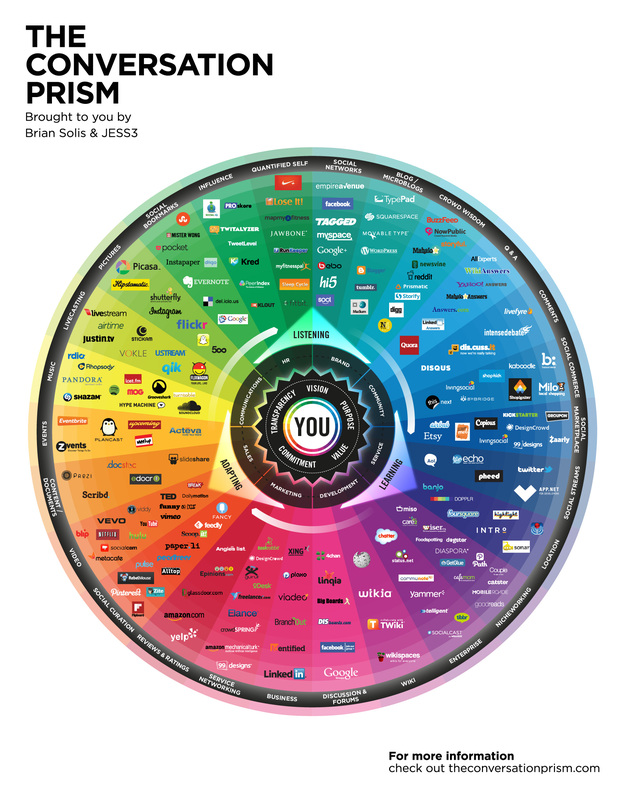 Just like with most LUMAscapes and other infographics that try and capture the social media landscape, the Conversation Prism is certainly not all-encompassing and won’t include all startups in the space. It’s been 2 1/2 years since this graphic has been updated and Solis tells us that the model has been changed from a flower-like motif to one that is much simpler and puts more focus on the ever-changing landscape. In a sign of the times, the Conversation Prism now includes sections dedicated towards the enterprise, which includes companies like Yammer, Salesforce Chatter, Socialcast, Tibbr, and others. Also included are influence-based services like Klout, Kred, TweetLevel, and PeerIndex; Quantified Self services including Nike+, Jawbone, MyFitnessPal, and Fitbit; Social marketplaces like Zaarly, Groupon, 99Designs, LivingSocial, Airbnb, and Etsy; and service networking startups Elance, CrowdSpring, oDesk, and TaskRabbit. The social landscape is evolving with increasing acceleration. As you can see throughout every iteration of the Prism, the number of networks that vanish and emerge is staggering. But more importantly, the nature and focus of how networks are used is also dramatic in its changes. In some cases, we see the move to smaller or more concentrated networks and at the same time the visual “social” web is becoming more pervasive. Interestingly, the newest version of the Conversation Prism has seen 122 services such as Utterz, Xanga, and Kyte removed from the chart, with 111 new ones added. In the next two years, with the state of companies being acquired, dissolved, founded, it will be fascinating to see what the new social media landscape will look like.